Albert Sidney Burleson writes to Woodrow Wilson regarding the post office in Brook Hill, VIrginia. 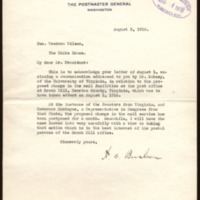 This is to acknowledge your letter of August 1, enclosing a communication addressed to you by Dr. Dabney, of the University of Virginia, in relation to the proposed change in the mail facilities at the post office at Brook Hill, Henrico County, Virginia, which was to have taken effect August 1, 1916. At the instance of the Senators from Virginia, and Governor Montague, a Representative in Congress from that State, the proposed change in the mail service has been postponed for a month. Meanwhile, I will have the case looked into very carefully with a view to taking that action which is in the best interest of the postal patrons of the Brook Hill office. Burleson, Albert Sidney, 1863-1937, “Albert Sidney Burleson to Woodrow Wilson,” 1916 August 3, WWP20511, University of Virginia Woodrow Wilson Letters, Woodrow Wilson Presidential Library & Museum, Staunton, Virginia.